HolyJuan: Google still using IE 6.0? 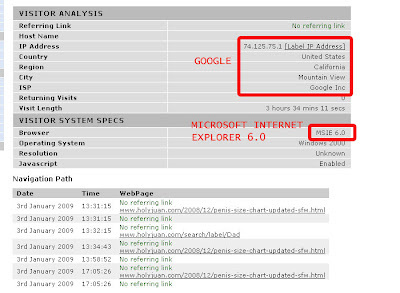 So I was surprised, when perusing my site's visitor log, that I came across someone from Google HQ on my site using IE 6.0! You mean you know when I linger too long on your site?? Ummm...I fell asleep with my fingers on the keyboard....yes..thats it. User-agent strings (which is to say, the type and version reported by the browser itself) is a notoriously fungible thing. Oftentimes, user agents that underreport their version are lumped into one of the bigger categories. This would seem to be the case here.